The A8 hybrid will go on sale next year. FRANKFURT -- Audi will unveil a production version of the A8 hybrid sedan at the Frankfurt auto show. 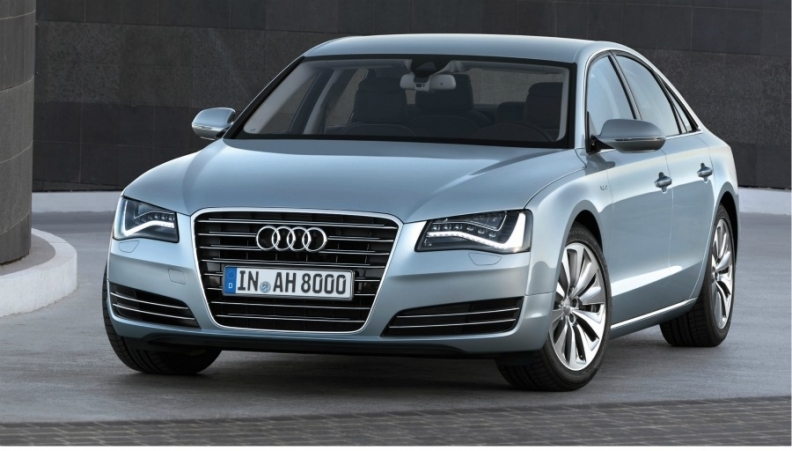 Audi said the A8 hybrid uses a four-cylinder gasoline engine for the first time in the A8 range. The 245hp 2.0-liter unit is combined with a 54hp electric motor powered by a lithium ion battery pack weighing 37kg. The car has a range of 3km while driven on battery power alone. Audi says the A8 hybrid will reach 0-100kph (62 mph) in 7.7 seconds and it has a top speed of 235kph (146mph). It uses 6.4 liters of fuel per 100km (44 UK mpg; 36.5 U.S. mpg) and has CO2 emissions of below 148g/km. The hybrid has an aluminum construction, which Audi says will make it one of the lightest sedans in its category, weighing 231kg, about 40 percent lighter than a comparable steel construction. The car will go on sale in Europe in late 2012. Further details including pricing will be released at the Frankfurt show, an Audi spokeswoman told Automotive News Europe.